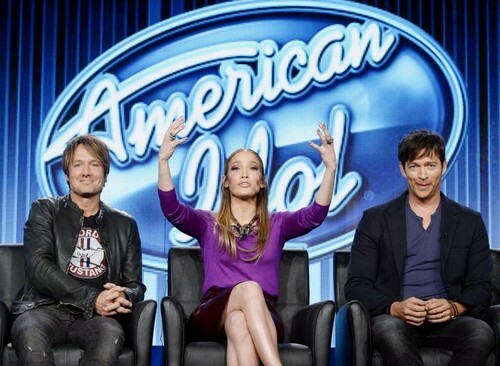 American Idol 2015 spoilers tease that Season 14 of the singing competition will kick off on FOX in 2015 on Wednesday January 7. Season 14 will kick off just like previous seasons of American Idol, with the judges visiting six different cities across the country for American Idol hopefuls’ auditions. However, spoilers tease that there 2015 American Idol schedule will differ from previous seasons. The first half of Season 14 will air two nights a week on FOX, however once the judges announce the Top 10 finalists – the series will drop down to one night a week. Instead of having a performances show and a results show, the singers will learn whether or not they have been eliminated the same night that they sing. In other American Idol Season 14 news, spoilers tease that celebrity judges Jennifer Lopez, Keith Urban, and Harry Connick Jr. will all be returning to the judge’s table. However, there will be some major cast changes. American Idol veteran judge Randy Jackson starred on 2014’s season of American Idol as a mentor to the competing singers. According to spoilers from FOX, Randy will not be returning for Season 14 and they have brought on Scott Borchetta, the president of Big Machine Records, to replace Jackson as the 2015 mentor. American Idol Season 14 spoilers also tease a fun new twit to the 2015 competition, and an additional $50,000 cash prize. FOX revealed earlier this year that during Season 14 there will be an American Idol crowned, and then one of the friends or family members that encouraged the singer to go to the American Idol auditions in the nearest city to them will also receive a $50,000 cash prize. So, do you still watch American Idol? After the show’s disastrous ratings last year do you think Season 14 will be the final season before FOX finally pulls the plug on it? Will the extra cash prize to a friend or family member of the winner be enough incentive for viewers to start tuning in again? Let us know what you think in the comments below and don’t forget to check CDL this season for all of your American Idol spoilers and news.